3, 2, 1…Time for some Christmas fun! Count the silly snowmen as they bounce and race and zoom into space! 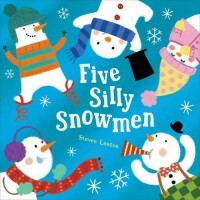 A hilarious Christmassy counting book with super fun illustrations and silly snowman scenes. This is a perfect winter-themed book to read together and an ideal Christmas present for toddlers and preschoolers who are learning to count. With a shiny, squishy cover for little hands! From the illustrator of the best-selling Shifty McGifty and Slippery Sam.